You are currently browsing the tag archive for the ‘oglala’ tag. I am not a “Warrior Princess”. Cante Waste ya Nape Ciyu zape ye (I greet you from my heart). This morning my Oglala Lakota grandmother called me upset because a group of people in Martin, South Dakota (a town bordered by Pine Ridge Indian Reservation and Rosebud Indian Reservation) intend to bring back the “Warrior Homecoming Ceremony” at Bennett County High School. To hear this news is deeply unsettling, as I believed we had come far in cultural understanding, only to see we are back where we began. But then again tribal nations, along with many secular and non-profit organizations, are still protesting the NFL team Redskins. So this leaves me joining with other voices in explaining why. This so-called “Warrior Homecoming Ceremony” was 57 years old when my twin sister Emma Eagle Heart-White and I began a protest in 1994 (at that time, we used the paternal side of family’s name of Trimble). 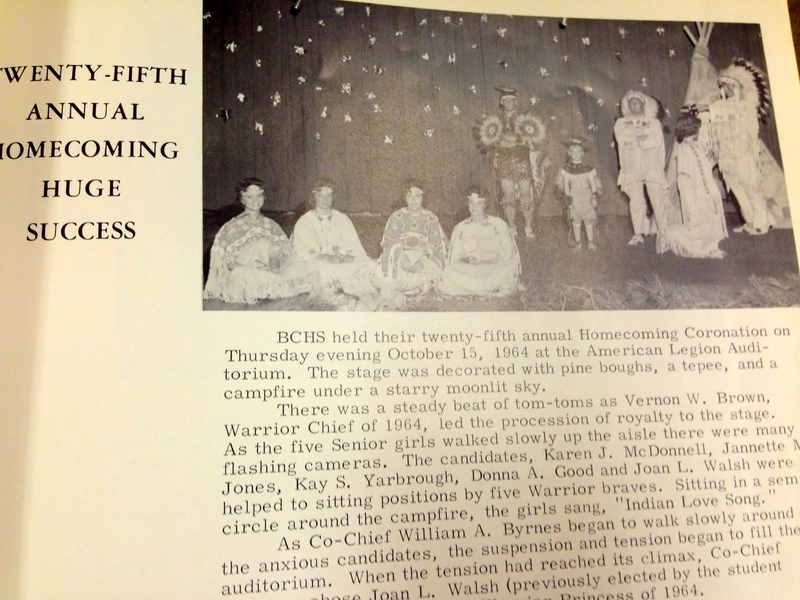 The “ceremony” consisted of a “Big Chief”, a “Medicine Man” and five “Warrior Princesses” who were chosen as the most popular in a high school racially divided between native and non-native students. The majority of those living in the town were non-native. We grew up in an Oglala Lakota tribal housing community called LaCreek Sunrise Housing, located a mile outside of the town of 1100 people. We attended Bennett County schools all of our lives. We were very involved in extra-curricular activities, including band, choir and cheerleading. At the time of our junior year in high school, we watched the “homecoming ceremony” drama play out in which the “Medicine Man” chooses a “Warrior Princess” for the “Big Chief” by inspecting her ears, mouth, hair, clothing and weight. The “Medicine Man” wore men’s traditional regalia complete with a roach and eagle feather bustle. The “Big Chief” wore a war bonnet. At sixteen years old, we knew this event was wrong and we knew no one else would do anything about this sexist and culturally degrading event. We knew we had to. In early 1994, we began researching ways to protest. We began by telling people about the event. We went on KILI radio and told the story to Indian Country Today. We found that because the community was so racially segregated, neighboring tribal communities had no idea of the event. Soon, tribal groups came to support our protest. By September 1994, the racially divided town was racially charged and we received threats of violence as the homecoming approached. Still, we felt spiritually called to end this event. We held an educational forum in the town park cumulating with a peaceful protest down main street to the auditorium where the “homecoming ceremony”. We formed a circle around the audience, holding hands the people chanted until we were kicked out by police officers for disturbing the peace. As college students, we returned to the small town annually for four years to protest. 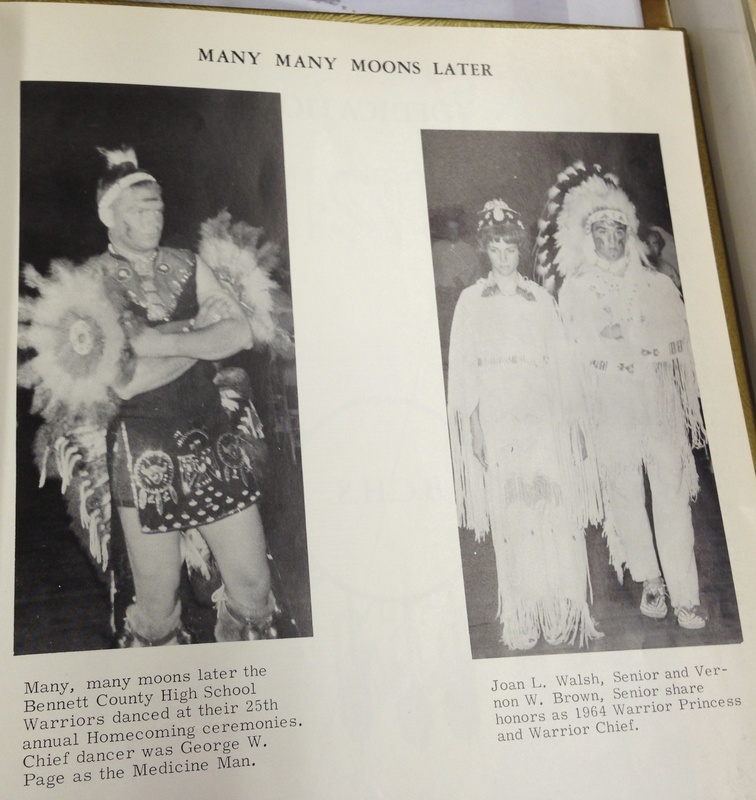 Finally in 1997, Bennett County High School Board voted to remove stereotypical “Indian Theme” from the Homecoming Coronation Ceremony. Bennett County High School Board requested a meeting with us. At that board meeting they informed us of their decision to discontinue the “Homecoming Ceremony” immediately and to phase out the mascot in the next few years. The school still has not phased out the mascot. It is now 2014, when I tell this story today many are aghast that its actual history in this lifetime. But on the other side, almost twenty years later, there is still ignorance about why this protest happened in the first place. As well as why there are protests against “Redskins” NFL football team today. In my career I have worked for military assistance programs in Pensacola, Florida; advertising at Viejas Casino in San Diego; and today I work as a Program Officer/Missioner for Indigenous Ministry of The Episcopal Church. I have been very blessed to travel the world personally and professionally to learn about cultural perspectives in Australia, Bolivia, Canada, Ecuador, France, Japan, Mexico, New Zealand, Italy, South Korea, Spain, Switzerland, and Venezuela. And yet, Martin, South Dakota will always be my home. I have witnessed the impact of colonization and the crucial need for healing. While our history as a nation is complex, just as our history as a church is complex, in 2009 The Episcopal Church (along with many other denominations) have repudiated the Doctrine of Discovery acknowledging the wrong in Manifest Destiny. Earlier this year, several denominations passed resolutions in support of tribal nations effort to discontinue “widespread exploitation, misuse and abuse of the cultures, symbols, identities, personalities and spirituality of individuals, tribes and nations… by some popular sports franchises”. Today, many denominations have dedicated their work to reconciliation and education, including advocating for accurate American Indian history education in all schools with revitalization of language and culture of American Indians. Working with clergy, tribal leaders, and counselors actively combatting issues related to poverty, alcohol and drug abuse, violence and suicide in Indian Country has taught me something else… ignorance is directly related to these epidemics. People who are ignorant to our history as a nation do not understand the impact these “Indian Themed” fantasies have on our people. They do not understand “playing Indian” as either an ugly pig-faced “Red Skin” or a sexually objectified “Warrior Princess” not only insults our proud tribal histories and culture today, but also denigrates the self – esteem of our native youth. It shows all indigenous people, we are not human to you. It shows us you don’t believe we deserve respect, nor do you wish to learn an accurate history, because the truth hurts. Today we live in an instant gratification society where everything is fast paced… and we want everything yesterday. It takes time to learn about history and culture. It takes time to build relationships with spiritual leaders and tribal communities. It takes times to being invited to experience traditional tribal ceremonies. Yet I’ve seen it done. I’ve seen non-native clergy working in tribal communities with tribal elders to teach all youth tribal creation stories. I’ve seen native and non-native clergy working with tribal leaders and elders to tell accurate histories as a way to reconcile past wrongs. I’ve seen these true leaders working together to better their communities and build partnerships for shared goals. One major goal is to keep our youth alive, help them to celebrate their identity, and teach the youth to walk on their own spiritual path. We are not living in the past anymore. It’s time to live in the present. It’s time to face the past, heal through education, and walk hand in hand for a better community today. Mitakuye Oyasin (All my relations).